An art installation that responds to music by syncing its motion with the frequency. The final project of the How to make almost anything course at Fab Lab deserves a special mention on its own for its novelty. The project was conceived by Ar. Urvi Sheth with whom me and Ankita were working as interns. Created using acrylic cut pieces after a series of design iterations on cardboard, the assembly twists around the central piece. 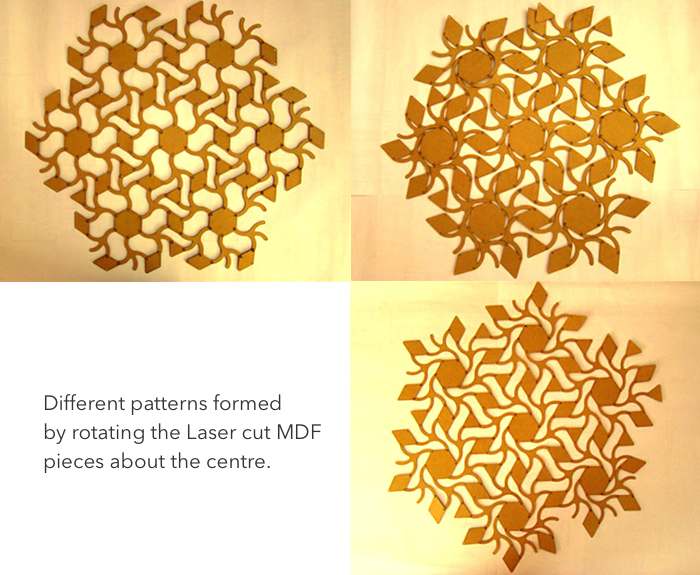 Ornamental patterns are generated through constrained rotational motion of successive pieces. The L293D Motor Driver (H-bridge PCB; 150 RPM, 12 V DC Motor) is connected to an Arduino Duemilanove (Freeduino) that modulates its RPM based on the frequency of music being played. A music is played on a laptop and a Processing sketch quantifies the frequencies through FFT Spectrum analysis (minim library) and passes it on to the Arduino sketch which then modulates the RPM according to frequency received. This project was headed by Ar. Urvi Sheth with whom I and Ankita Diwan worked as interns. The project was inspired by the works of Akira Nishihara who has conceived geometrical tile patterns that are connected in a way that they reconfigure to different patterns when twisted. 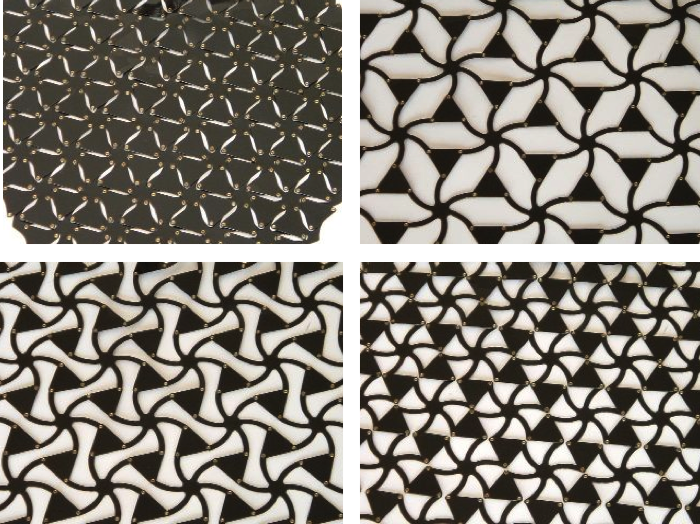 Different patterns of an arrangement of connected tiles. Such a pattern was perfect for this project. The idea was to make a facade out of tiles that are rotated by a motor which is in turn triggered by music. 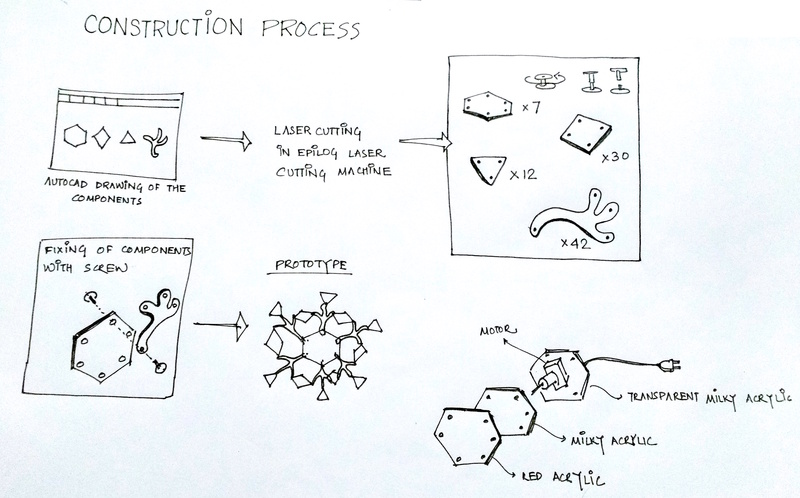 The storyboarding help us arrive at the initial MDF prototype with dimensions assumed by the image. For the initial prototype, pieces of MDF were cut and joined together with rivets. We however noted that the measurements just didn't work. The transition wasn't smooth. After several iterations of adjusting the dimensions and rivet sizes, an acrylic prototype was made. 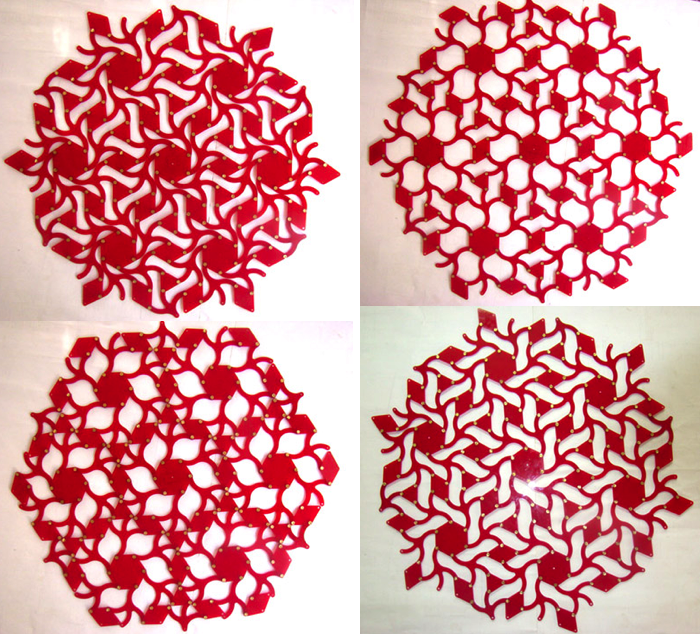 Each prototype consisted of 1 hexagon, 5 triangles, 6 rhombi and 6 floral pattern figures. All these figures were joined with 24 rivets. The final assembly was made up of 7 fundamental units. Now, the circuit consisting of L293D Motor Driver (H-bridge PCB; 150 RPM, 12 V DC Motor) and an Arduino Duemilanove (Freeduino) is set up. The motor was then controlled via sensing the music being played using the Ess library in Processing. The final prototype needs 7 motors synced together, however it was mechanically very difficult to make the facade stand. Hence a frame was made for the installation. I devised a numerical method to automate the (really boring) process of zoning a site for an architectural project by taking into account climatological and toplogical input from the architect. I designed a 15 feet tall structure dedicated to the Alumni Batch of 1972 of IIT Kharagpur. The designed evolved through a series of sketches and initial walkthrough renders. I interned under Prof. Gerhard Schmitt at the Chair of Information Architecture. I implemented machine learning to create tools that enable architects to design spaces with greater control on the cognitive response of the user. Based on my performance and enthusiasm, I was offered a research project at Bauhaus University, Weimar. I was the Product Design intern at Witworks, a tech startup founded by alumni of my university in Bangalore. I worked on their second product called 'Blink', an IoT wearable that provide access to services on-the-go. Through the branding campaign and media content, I helped increase the brand visibility and social media outreach to 16k Facebook followers. As a maker intern, I developed 'The Musical Facade', a dynamic screen that responds to music with motion. I did hands-on programming, electronic design, digitial fabrication to materialize my ideas into things. 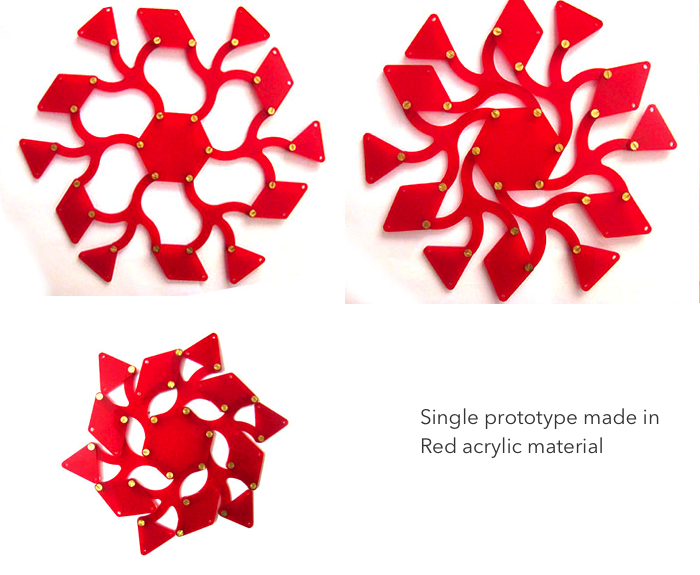 I got accepted to the Smartgeometry 2014 based on my work at FabLab, being the youngest international delegate at the conference. I was selected in the '20,000 Blocks' Cluster headed by DU Darmstadt at Smartgeometry 2016. We worked on a gamified architectural platform to allow non-architects be an active part of the design process while having fun. In the 2014 edition, I was part of the 'Design Space Exploration' Cluster headed by ETH Zurich. We worked on devising algorithms that automated urban planning by taking subjective user input into consideration. I was the Winner at Global Entrepreneurship Summit 2017 Hackathon organized by Gupshup. I built a Messenger chatbot that helped people find their missing items by pairing them with people in a 7 kilometer radius zone who have reported a found report to the bot matching their description. Source can be found here. My team 'Trafix' was the Finalist ( Top 10 in India ) in the GE Edison Challenge 2016. We built an app prototype that uses gamificiation to make following traffic rules fun. Trafix uses route planning algorithms on crowdsourced data to predict traffic congestion and plan individual trips in a way that optimizes the overall traffic. I was the Quarter Finalist ( Top 40 in India ) at Tata Social Enterprise Challenge 2016 for 'Pullypal', a social initiative that focuses on generating employment through rural tourism. Pullypal offers a unique experience to travelers who wish for a more immersive cultural and social experience in their travel. My blog about my experience at ETH as a research intern got selected as a 'remarkable internship' by Internshala, India's largest portal for student internships. You can check out the other things I do here. My Myers-Briggs Type Indicator(MBTI) is INFP [Introvert | iNtuitive | Feeling | Prospecting]. The favorite people I share my type with are Kurt Kobain, Bill Watterson, Lana Del Rey, and Calvin. You can find yours here. I make movies about things that strike a chord with me. 'Sweeten' is both about nothing and many things at once. I made it on my visit to Sweden, and hence the pun. 'Melancholic Times' is shot in the ancient city 'Hampi'; it captures moments of contrasting inner peace and turmoil. I also make not-so-serious videos, mostly Indian college-centric ones under the banner of 'Spectecool' (34k+ views). While at it, you may also like to see me being kicked out of my comfort zone performing stand up comedy over here. I click pictures of pretty places here. I pen down my thoughts on issues I care about on Medium and answer questions that I think will be of use to others on Quora. Some articles that I like are: The Open Cage: Modern Day Slavery and Religion 2.0. My article on consumer behavior titled 'The Irrational Consumer' was published in Economica, the publication on economics and public policy by Economics Club, IIT Delhi. Questions I've answered about architecture: What are the most well architected buildings in the world?, , What career paths combine computer science and architecture?, What is the difference between a 'space' and a 'place' in architecture? and some general ones: Why is money not the most important thing in life?, What is a paradigm shift?, Why are some languages written with straight lines while others with curved lines?, How can I visualize 4D shapes in my mind? I am part of the LGBTQ support group in my campus called 'Ambar' which is trying to sensitize the student community about gender diversity and make the campus a better place for all students irrespective of their orientation. As the member of the Debating Society, I have represented IIT Kharagpur in four national tournaments: National Law University Asian Parliamentary Debate 2012, IIT Bombay British Parliamentary Debate 2013, IIT Delhi Asian Parliamentary Debate 2013 and Kalinga School of Law Asian Parliamentary Debate 2012. I am also the Winner of the National Level Debate at Spring Fest 2015 that had 300+ participants. I was the Director of Communications at Model United Nations too in 2013. I have a love-hate relationship with Architecture. To me, Architecture is a field which in its essence is as surreal as poetry or music but has been reduced to the stature of make-up for real estate. I think Architecture is more about the soul and the mind than about buildings. I do not inted to pursue the field in the way it is practiced, but I do value the impact of the architectural design process in all of my works. For my undergrad thesis (to be completed by July 2017), I am designing the 'Centre for Emotional Technology and Artificial Intelligence' that shall embody everything I have learnt and wish to give back to architecture. Thank you for your time. You can find my resume here.